You are traveling to London. You like reading about true crime. From Goodreads.com: "From Sherlock Holmes’s Baker Street and Jack the Ripper’s Whitechapel to the East End of the Krays and The Sweeney’s Hammersmith, London’s streets have played silent witness to countless crimes both real and imagined. Moreover, in print and on screen the city has exported its criminal heritage to the world, becoming a global capital of wrongdoing rivalled only by New York and Los Angeles. Yet, until now, there has been no single guide to its darker points of interest. Traversing the city’s factual and fictional past, Criminal London features five original walks and over a hundred locations, including: the scenes of infamous murders, watering holes frequented by notorious felons, the homes of great consulting detectives, and locations from London’s rich history of law and order, such as the Clink, Tyburn Tree and Bow Street Police Station. Aimed at adventurous tourists who enjoy exploring the surprising nooks and crannies of their city, this is a sightseeing guide for the intrepid." Looking for a great guide book to give you a taste of the underbelly of London? Criminal London might be the book for you. 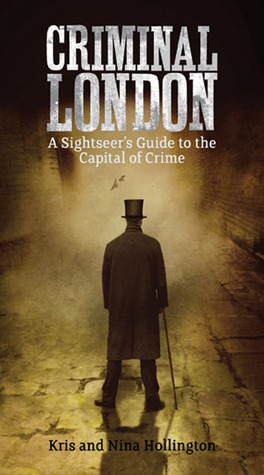 This book shows you the sights of some of the great crimes and criminals of London. Yes, it's a little creepy but some of the sights seem very cool. I love using guidebooks when I travel abroad. It's nice to have a summary of some of the "must-see" sights that you should try to see when you visit. I could see this guidebook in particular being a really fun book to take on a themed trip to London. Imagine playing Sherlock Holmes in an amazing city like London (um, where do I sign up?). This book is very accessible. One thing I really like is that each site has a tube station listing, which is super helpful for someplace like London where public transportation quickly becomes your best friend. Overall, this is a pretty good guide book, which will appeal to those who want to be a little creeped out by their travels (in a good way, I promise! ).